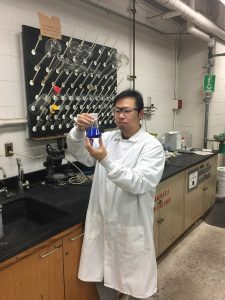 I am a Ph.D. student in Chemical Engineering Department, and this is my fourth year. My research focuses on the dephosphorization from iron ore, particularly goethitic iron ore. I have been working with Dr. Tim Eisele on this project since fall 2014. By applying both bacterial and chemical leaching methods, we are able to remove about 95% of the phosphorus from the ore making the ore successfully meet the industrial standard. I would like to express my deepest gratitude to the Graduate School for the financial support, which allows me to focus entirely on the completion of my final dissertation. I also want to thank Dr. Eisele for his constant support throughout my entire graduate school studies.